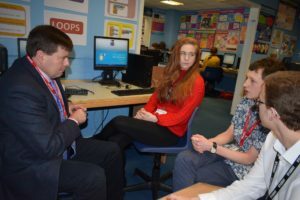 Cumbria’s Police and Crime Commissioner Peter McCall, attended Cockermouth School on Tuesday 6 February to see first-hand what activities the students had planned for Safer Internet Day 2018, which also falls within Hate Crime Awareness Week. As part of the visit, Mr McCall was introduced to students who take the lead on matters such as internet safety, anti-bullying, and raising awareness of hate-crime. Peter McCall said: “Firstly, I must say a big ‘thank you’ to the staff and students at Cockermouth School for organising my visit today, I was really impressed with everyone I met; their professionalism, enthusiasm and passion shone through.